Do you want a pitcher style water filter that does more than just make the water taste better? One that goes beyond removing chlorine and reduces other dangerous contaminants like lead, Chromium-6 and fluoride? That's exactly what I was looking for when I was getting ready for a trip that included a long stay in a hotel. I wanted to take along a filter that was portable and easy to use. And I wanted one that would give me great tasting water that's also good for my health. After doing a lot of research, I decided to buy an Alexapure water filter pitcher. I liked it so much, that I wanted to tell you about it. It might just be the filter pitcher you're looking for! Keep reading to learn more about the features of the Alexapure, how it works and what it filters out, where to get a good price on one, and lots more. You can click on your most pressing question in the quick navigation below, or keep scrolling to read the whole review. In a big hurry? Just want to read the reviews and check the price at Amazon? Then click here. Or click here to check out the price at the manufacturer's website. 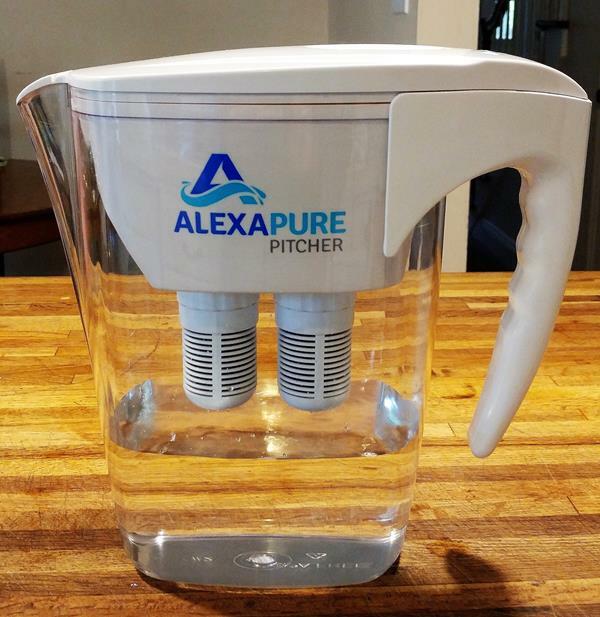 What are the features of the Alexapure pitcher water filtration system? What does the Alexapure pitcher filter out? Does it take out beneficial minerals? How much does the Alexapure pitcher hold? How fast can it filter water? Will it work with water from natural sources? How often do you have to replace the filters? What is the purpose of the filter primer? What are the pros and cons of the Alexapure filter pitcher? Where can I get a good price on an Alexapure pitcher? Verdict: Should I buy an Alexapure filter pitcher? It's made in the USA. Alexapure is one of several brands from a family-owned company called My Patriot Supply. They sell survival and preparedness products. Lab test results show that the Alexapure pitcher filter reduces fluoride by 90%. It's hard to find a water filter pitcher that reduces fluoride at all, so that's not too bad. Because it uses a carbon filter, the Alexapure pitcher leaves those good minerals in the water. 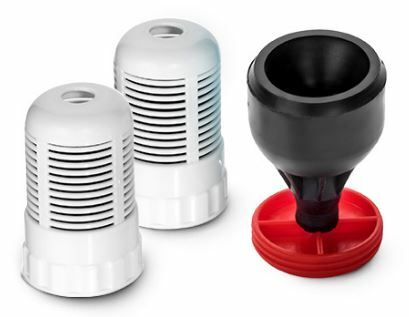 The system is made up of three basic parts: the pitcher, the reservoir, and two activated carbon filters, which are screwed onto the bottom of the reservoir. To use it, you fill the reservoir with water and let gravity do its thing. The water goes through the filters and drips down into the main part of the pitcher. I like the design of the lid a lot. You don't have to take the lid off to fill it. Just hold it under the faucet and turn on the water. The force of the water pushes down the flap over the opening. Turn the water off, and the flap closes. Another thing I like about the lid is that it doesn't come off easily. In fact, if you want to remove the lid, you have to kind of pry it off. But that's a good thing. It means you don't have to worry about it falling off while you're pouring a glass of water. It can hold 8 cups (a half gallon) of water. That's what it says on the box, anyway. It'll actually hold a little bit more than that. Now, you can't just pour 8 cups of water into the reservoir all at once. The reservoir only holds 5 cups. So if the pitcher is empty, you can fill the reservoir to the top, then wait a few minutes and put in more water. The manufacturer says that it filters 8 cups in 7.5 minutes. Well, maybe it can under perfect laboratory conditions, but it's not what I found in my own test at home. I started with an empty pitcher and reservoir, and I timed how long it took to completely filter 8 full cups of water. You can't put 8 whole cups in the reservoir at one time, so I had to keep pouring in more water throughout the test. The first half went faster than the second half. It took 9.5 minutes for the water level to reach the bottom of the filters in the pitcher. That was 5.5 cups, so that makes the flow rate at that point 1.7 minutes per cup. At this rate, it would filter 8 cups in about 13.5 minutes. But, once the water level reached the filters and they became submerged, the flow rate slowed down quite a bit. It did, however, continue to filter through until the reservoir was totally empty. In all it took about 20 minutes from start to finish. Of course, that's not how you would normally use the pitcher. Most of the time you're just going to fill the reservoir, set it aside, and go back and use the water later. You're not going to be standing around waiting to get your half gallon of water. And you don't have to wait for all the water to go through the filters before you can use it. Just don't try to pour out a glass of water when the reservoir is full, or it will leak out the top. I also want to note that there are other factors that can slow down the flow rate. The quality of the water you put in can make a big difference. So can the age of the filters. This wasn't a controlled scientific experiment. It was just me and my pitcher and a stopwatch in the kitchen. I suppose 10 different people might get 10 different results. This filter pitcher is designed to be used with chlorinated or disinfected water only. It doesn't remove biological contaminants like bacteria. So you shouldn't use it with well water unless the water has been disinfected. This is according to the manufacturer's recommendation. If you want to be able to filter water directly from natural sources like streams or ponds, you might want to consider the Alexapure Pro countertop gravity filter. The filter element is made of activated carbon in a BPA free plastic case. The manufacturer recommends that filters be replaced after 80 gallons, or about every 60 days, if you're using it on a regular basis. But, in the owner's manual, it says that the filters can last for up to 250 gallons. I was a bit confused by this, so I asked the manufacturer about the discrepancy. The answer was that the "Alexapure pitcher filter is designed to last 80 to 250 gallons, depending on the turbidity of the water." In other words, the filter life is going to depend in large part on the quality of the water you put into it. If you have a lot of minerals in your tap water, it's going to make your filters wear out faster. The way to tell if your filters need to be replaced is if the flow rate slows way down. You can try re-priming the filters and see if that makes the water go through the filters faster. If it doesn't, then you should replace the filters. You can buy them directly from My Patriot Supply. Or, check for availability and price at Amazon. Yes, only BPA-free food grade plastic is used in the Alexapure pitcher and the filter elements. The filters are dry when you get them, so they can't absorb water easily. Priming forces water through the filter so it becomes saturated. This gets the flow going. The primer screws onto the filter, and then you put the rubber gasket on your faucet and turn on a steady stream of water for a few minutes. Sometimes the flow might slow down, but there's still life left in the filter. You can try priming the filter to clear it out and get it working better again. This list is based on my own experience and other people's opinions that I read online. It doesn't exactly have a warranty. What is does have is a "45-day no questions asked guarantee" on unopened products. After 45 days, or on opened products, they say they will review return requests on a case-by-case basis. This seems a bit ambiguous to me. I would prefer a warranty with specific terms, but to me, it's not a deal breaker. The company does care about its reputation and I'm sure they'll work with anyone that has problems with a new pitcher. My suggestion is to check the price at Amazon and at My Patriot Supply. Click here to go to Amazon to check the current price and see if there are any special discounts. Click here to go to My Patriot Supply to check the current price. If you're going to invest in a water filter pitcher for your health, get one that does more than just make the water taste better. Sure, you can get yourself a cheap Brita pitcher, but it's not going to protect you from most of the most dangerous contaminants that are all too often found in our water supply. As the lab tests show, the Alexapure pitcher filter does much more than most of the other brands out there. It's also sturdy and easy to use. The lid doesn't fall off, the handle is comfortable, and it fits nicely in the refrigerator. And, of course, there's the taste. My Alexapure made nasty-tasting coastal Carolina hotel water taste as good as any spring water I've ever had. It works! I've had nothing but good experiences with mine, and I highly recommend it. 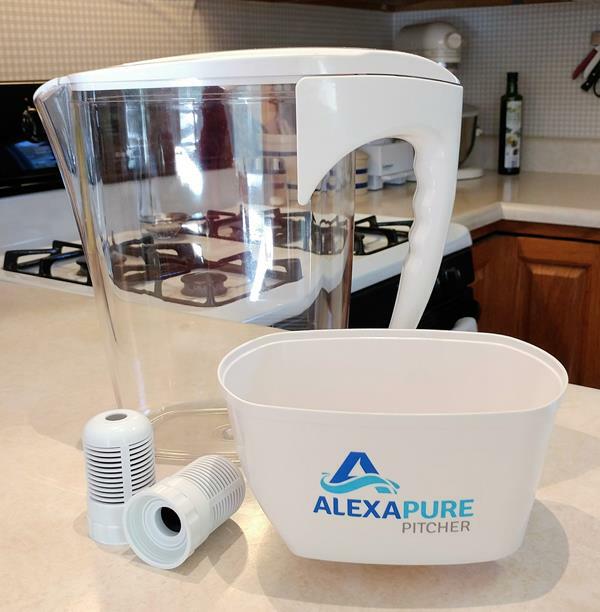 Get an Alexapure pitcher filter for yourself today, and start enjoying the taste and health benefits of pure water at home, the office, or on the road. Click here to check the price and read the reviews at Amazon. Or click here to check for any special deals at My Patriot Supply. If you'd like to check out some other pitcher filter options, please click here to go to my review of the best water filter pitchers for 2018.